Emory observance will include a display of about 800 panels from the AIDS Memorial Quilt, speakers, a community fair and free HIV testing. Emory Photo/Video. Dec. 1 is World AIDS Day. Emory has several related events planned that week to build awareness for HIV and AIDS. Dec. 1, 10 a.m. – 4 p.m. In the everyday hustle and bustle of living, it can be easy for some students to overlook big issues that don't necessarily directly touch their lives — like the worldwide AIDS epidemic. But on Dec. 1, it will be hard to overlook the massive quilt on Emory's quad in honor of World AIDS Day. "In the world we live in at Emory, it's not a prevalent issue that most of us think about in our daily lives. It's important to help remind the public, even if it's just that one day. They'll walk by the quilt and think about it at least for those few minutes," says Rachel Wolfman, a junior majoring in marketing and director of marketing for the event. 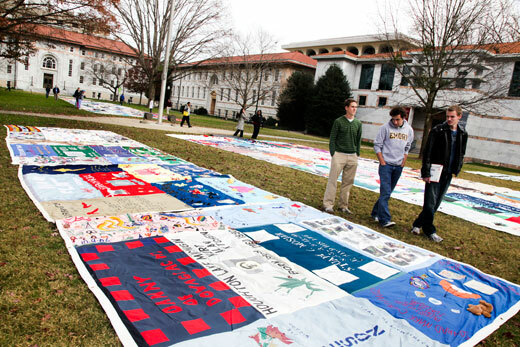 This year marks the 10th anniversary of Emory's Quilt on the Quad, the largest collegiate display of AIDS memorial quilt panels in the U.S. The event, to be held Dec. 1 from 10 a.m. until 4 p.m., will include speakers Guido Silvestri, an AIDS researcher, and Doug Shipman, CEO of the Center for Civil and Human Rights, at noon; a community fair with booths from local non-profits and business who support the fight against AIDS; and, for the first time, on-site, free HIV tests for students. The HIV test requires only a cheek swab, no needles involved. The AIDS Memorial Quilt was founded in 1987 and now contains more than 48,000 individual panels, each measuring 3 feet by 6 feet and honoring a person who died as a result of AIDS. Each year, Emory student organizers receive around 800 quilt panels to display. Panels will be arranged in the shape of a ribbon for this year's event, harkening to the iconic red ribbon used to raise AIDS awareness, says Jessica Moore, a junior majoring in neuroscience/behavioral biology and co-president of the Quilt on the Quad event. While the plan is to display the quilt on the quad, the rain location for the display will be the DUC Terraces, Moore adds. This year, Quilt on the Quad will emphasize both the national and international urgency of the fight against AIDS, says Moore, who has a personal mission to promote AIDS awareness. "I have a direct connection to AIDS – my aunt was an AIDS victim when I was 4. She has a quilt and we bring it out every year. That's what sparked my interest. But I actually didn't know that much about AIDS growing up, it was a sort of mystical disease to me, a lot of rumors," Moore says. Now that more is known about AIDS and there are better treatments available in the U.S., many have let the issue move to the backburner in their minds, Moore says. "The fact is, in a global sense, there's no way we're even half-way done with the battle against AIDS. As a developed country, it's very easy to forget that," Moore says. The CDC estimates that 1.14 million people in the U.S. are living with HIV, with roughly 50,000 new infections per year. Of those who are HIV positive, almost 16 percent do not know their status. According to the World Health Organization, approximately 35 million people worldwide are living with HIV/AIDS; sub-Saharan Africa is the most affected region, with 24.7 million living with HIV. Emory physicians, scientists and educators have played a key role in HIV/AIDS discovery and treatment from the earliest days of the epidemic. Emory researchers invented HIV/AIDS drugs currently used by more than 94 percent of U.S. patients and thousands more globally. They developed and continue to test promising vaccines. Emory physicians treat and counsel thousands of HIV/AIDS patients each year, and teach and train new physicians and research leaders. The Emory Center for AIDS Research (CFAR) provides support for 245 Emory and affiliated faculty, research fellows and post-doctoral fellows who conduct research locally (at Emory University, Morehouse School of Medicine, and in the Atlanta community), nationally and throughout the world. The NAMES Project Foundation Inc., headquartered in Atlanta, is the international curator of the AIDS Memorial Quilt. The foundation was established with the mission of preserving, caring for and using the AIDS Memorial Quilt to inspire action, heighten awareness and foster healing in the age of AIDS.